What It’s About: Strangers take refugee in a farm-house in rural Pennsylvania from the recently dead, who returned to life with a hunger for the flesh of the living. Why Watch it Today? : Night of the Living Dead takes place just at dusk on the Summer Solstice. 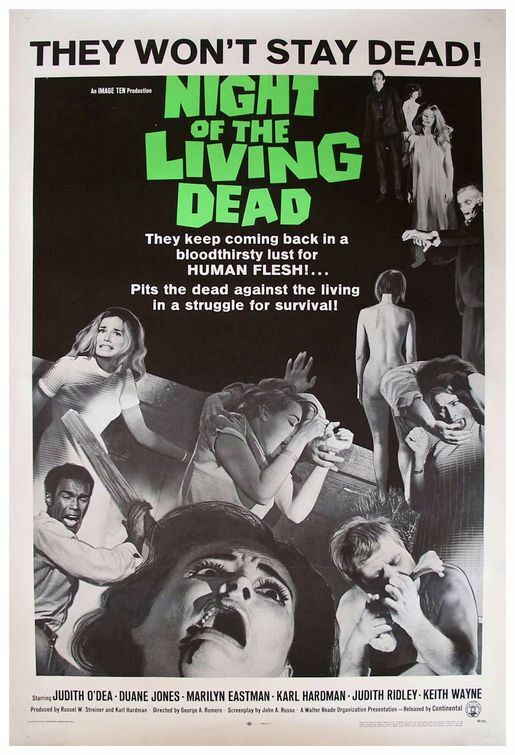 Night of the Living Dead was horror legend George A. Romero’s first film, a tremendous success, and responsible for replacing the traditional zombie-the dead raised by a voodoo priest and robbed of their souls for unending slavery-with the modern mindless flesh eaters. Night of the Living Dead is a still disturbing horror classic. I suggest turning it on just before dark. This entry was posted in Black and White, Horror, Independent, Movie of the Day, The Original, Zombies and tagged cannibalism, Drive-In, Duane Jones, George A. Romero, low-budget, matricide, patricide, Pennsylvania, posse, rednecks, shocker ending. a movie that aip refused to release—cause it didn’t fit in with their drive-in formula.